A Recipe for Compost Tea that is rich in microbials and nutrients. The reason behind compost tea is that we want to grow nutritious vegetables and fruit, full of needed trace minerals. 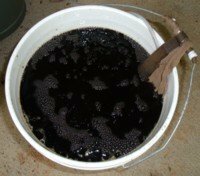 Here is a recipe for compost tea that is nutrient rich and microbe diversified, to help you grow incredibly healthy plants. Although it is not necessary to include all of the following ingredients, each one adds its own array of nutrients or microbials. CLICK HERE for details about each of the following components. Several days before brewing your tea, mix some fungi food (like powdered oatmeal) into 1/2 gallon of moist compost, cover it, then store in a warm, dark place. When you are ready to brew your tea, your compost will be covered with strands of fungi. This will inoculate your tea with beneficial fungi. Start with 3 gallons of water. Pour in the liquid ingredients and stir. Dilute your molasses in a pint of water before pouring it in your bucket. Unless you thin it down it tends to just sink to the bottom. 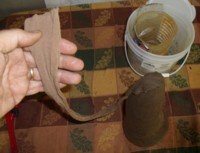 For your dry ingredients, you may either put them in a nylon stocking or gunny sack and suspend it in your bucket, or stir the dry ingredients directly into the water. In this recipe for compost tea, oxygen is a vital ingredient. If you try to make your compost tea without pumping air through it, it will probably go anaerobic, and stink. We want to keep our compost tea aerobic. Turn your bubbler on, and let the oxygen bubble up through your tea for 2 to 3 days. You will see a froth form in the top of the bucket. This is a good indication that the bacteria are multiplying! Once your tea is brewed, try to use it within a day. Once the bacteria’s food source is exhausted, they will go dormant or die. Compost tea can be a valuable contribution to a garden. However, I believe that even more can be accomplished, and quite economically, with the right soil conditioner. Check it out! Click here for more tips on gardening. Happy Gardening!